A change of pace this week. Tomorrow is my granddad's birthday. He died 26 years ago and we all still miss him every single day. He was a wonderful man, a great role model, and my favourite man in the world while he was still alive. 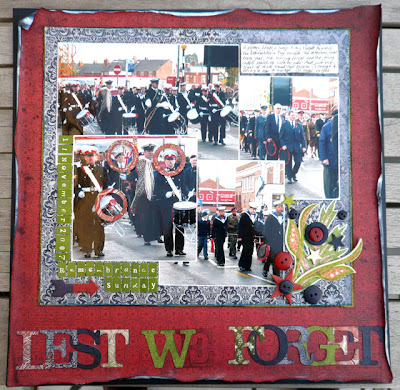 And Friday 11th November marks Remembrance Day which commemorates Armistice Day 1918, when the guns fell silent on the "eleventh hour of the eleventh day of the eleventh month" marking the end of World War I. Coming so close together, these two events are always linked in my mind and my heart. Happy memories of my grandfather tinged with sadness with him no longer being here and the memories of fallen soldiers as part of Remembrance Day. I thought of making this week's prompt to be inspired by sadness but that seems a little melancholy for sure. Not that I don't think there is space in one's albums for a little sadness but let's try to lift it a notch and make it a little brighter. Therefore, this week I'd like you to be inspired by the remembrance poppy. 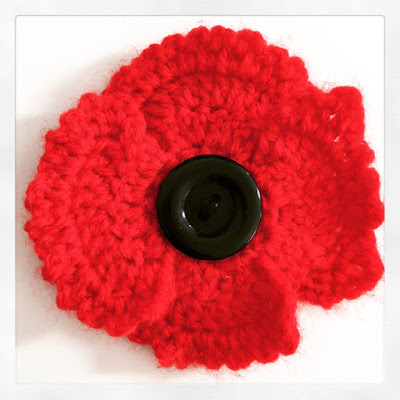 A beautiful hand-crocheted poppy made by the über-creative Lesley over at Oh! Blog it! The poppy is a symbol of Remembrance Day, bringing to mind the poppy fields of Flanders where so many young men fell during WWI. But at the same time as representing something sad, it's something more for me. It's almost as if the poppy of Remembrance Day is also there for me to remember my granddad and the bright red flower which I wear with pride adds a splash of colour on an otherwise sad, dull November day. I've scrapped about Remembrance Day before and also featured my hand-made crocheted poppy which reminds me of home. You might also have a poppy story and for those in the UK, you might have been lucky enough to see the Tower of London poppy art installation in 2014. 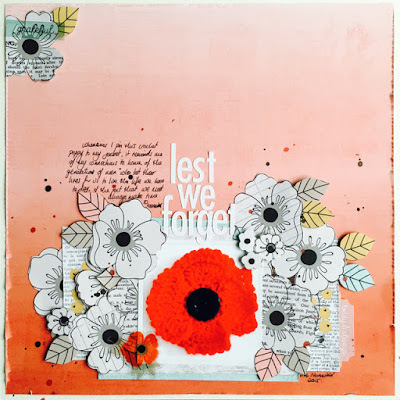 There might be a symbol that you chose to wear to remember something specific or you might wish to create a project about remembrance or a relative who served in WWI or another conflict. What about your own Remembrance Day (different countries call it different names but the meaning is always the same)? What about someone special to you who also has a birthday this week? Or you could tie it in to bittersweet feelings like I described. Several ways to take this prompt this week and they are certainly not all sad. You can either upload your layout into the Whimsical Musings Flickr gallery with the tag WM#236 or you can post it in our Whimsical Musings Facebook group. We've decided that we'll save albums for special occasions so just load up your photo to the group with the tag WM#236 in the write up text so that we can find it.